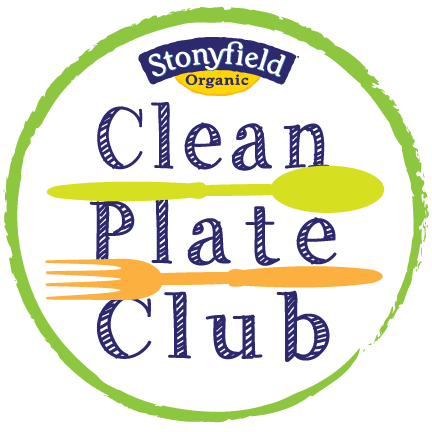 This month, Stonyfield Clean Plate Club members are partnering with our friends at Bob’s Red Mill to feature some amazing recipes that pair Stonyfield's delicious organic yogurt with their nutritious steel cut oats. With Fall quickly making its way to Texas, cooler mornings are finally on the horizon. 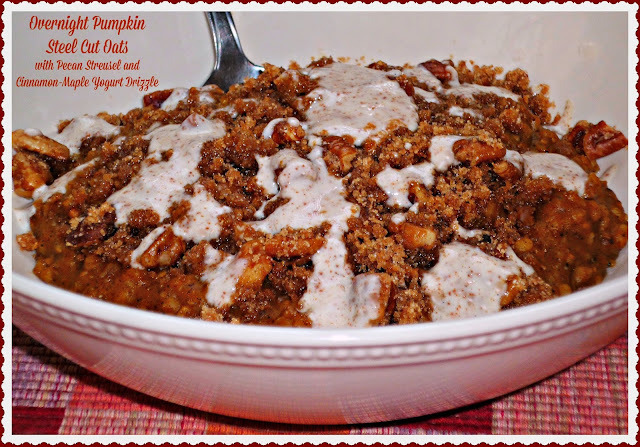 That means it's time to transition to warm, comforting breakfasts like my decadent Overnight Pumpkin Steel Cut Oats with Pecan Streusel and Cinnamon-Maple Yogurt Drizzle. Every spoonful of this over-the-top oatmeal is literally a taste of Fall! Simply assemble the streusel and yogurt drizzle before you go to bed. 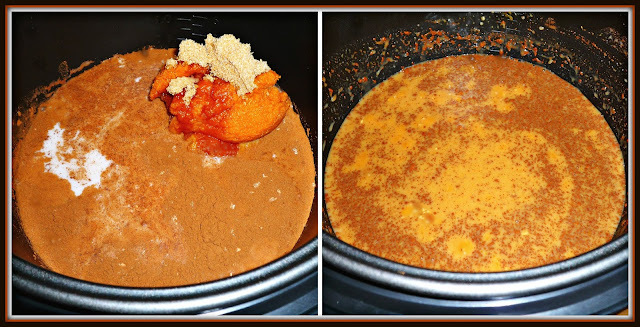 Then, take a few minutes to add all of the oatmeal ingredients to a slow cooker. The rest of the cooking is all hands-off. You’ll wake up the next morning to amazing smells coming from your kitchen...and a hearty, healthy breakfast that's ready to eat in mere minutes! If you’ve never tasted steel cut oats before, then you’re in for a real treat! Bob's Red Mill steel cut oats are a bit heartier and chewier than traditional old-fashioned oats. Each 1/2-cup serving contain 5 grams of filling fiber and 7 grams of protein. Talk about a breakfast with sticking power! If you love pumpkin pie, then you’re going to go crazy for this pumpkin-infused oatmeal. 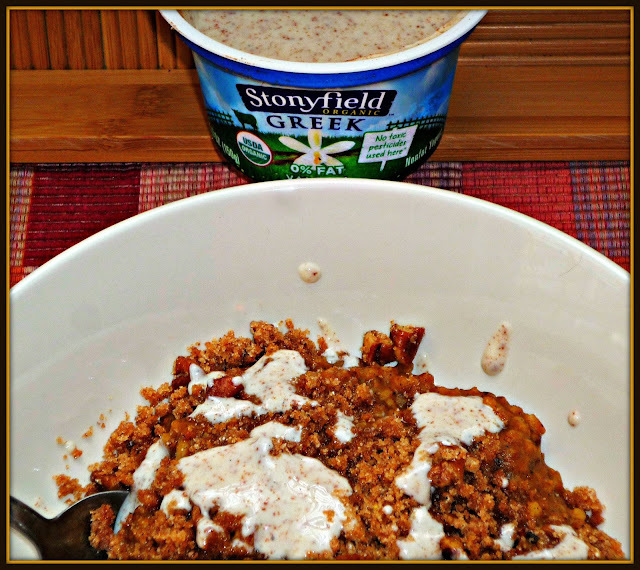 Before serving, each bowl is sprinkled with a flavorful pecan streusel and topped with a maple and cinnamon-infused drizzle made with Stonyfield Vanilla 0% Greek Yogurt. Step 1: Add the Bob's Red Mill Steel Cut Oats, almond milk, pumpkin puree, maple syrup, cinnamon, and nutmeg to a slow cooker. Whisk until all of the ingredients are completely incorporated. Cover the slow cooker and cook the oatmeal on Low power for 6 hours. Step 2: Up to 24 hours ahead, make the streusel and yogurt drizzle. 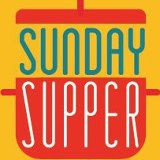 To make the streusel, add the pecans, whole wheat flour, brown sugar, cinnamon, nutmeg, and melted butter to a small bowl. Stir until the butter is completely incorporated into the dry ingredients. To make the yogurt drizzle, add the maple syrup and cinnamon to the container of Stonyfield Vanilla 0% Greek Yogurt; stir to completely combine. Cover both containers with plastic wrap and store in the fridge until ready to serve the yogurt. Step 3: When the oats have finished cooking, give them stir to incorporate any liquid that remains on top into the cooked oats. 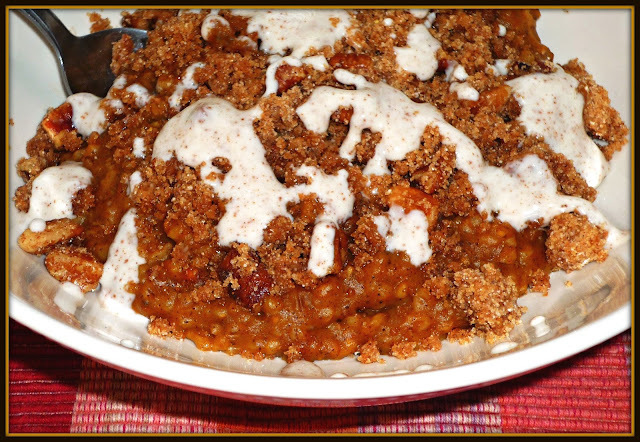 Spoon the oats into deep bowls and top with a generous amount of the pecan streusel. Finally, drizzle some of the cinnamon-maple yogurt sauce on top of the streusel. Wowza, is this ever oatmeal delicious…it’s a perfect way to start the day! The oatmeal is hearty and perfectly sweet, with a distinct pumpkin flavor. The nutty streusel topping provides texture and flavor, and the yogurt drizzle provides a tangy-sweet punch of flavor. A bowl of this oatmeal keeps me energized and full all morning long. This Fall oatmeal would be really be an ideal breakfast to serve on Thanksgiving morning…simply assemble the night before and you have a perfect ready-to-eat breakfast to power you until it’s time to enjoy the big feast later in the day. Disclosure: This is a compensated post for the Stonyfield Clean Plate Club. 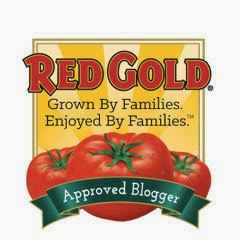 I also received steel cut oats from Bob's Red Mill and containers of Stonyfield to facilitate this post. All opinions are solely my own.